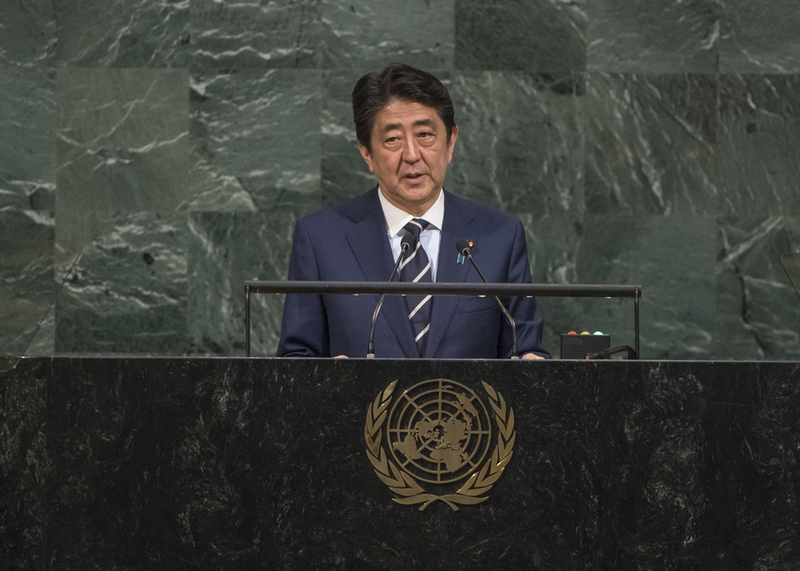 SHINZO ABE, Prime Minister of Japan, said the two recent missile launches by the Democratic People’s Republic of Korea had been programmed to fly over Japan. The gravity of that threat was unprecedented and indisputably a matter of urgency. “North Korea is attempting to dismiss with a smirk the efforts towards disarmament we have assiduously undertaken over the years,” he said, adding that the non‑proliferation regime was about to suffer a serious blow from its most confident disrupter ever. The recent crisis was of an altogether different dimension. The Democratic People’s Republic of Korea’s nuclear weapons either were, or were on the verge, of becoming hydrogen bombs and their means of delivery would sooner or later be intercontinental ballistic missiles. He said it was not a lack of dialogue that had given rise to the current situation. Dialogue had dissuaded the Democratic People’s Republic of Korea from pursuing its nuclear ambitions twice thus far, having saved the world from crises. However, Pyongyang had never intended to abandon its nuclear ambitions, which had become apparent to all. It had defrauded the United States, Republic of Korea and Japan of assistance and betrayed the good faith of the Korean Peninsula Energy Development Organization. Since 1994, the international community had continued its efforts towards dialogue with the Democratic People’s Republic of Korea, he said, with great perseverance, first through the Agreed Framework, and later, the Six-Party Talks. However, the international community had learned that the Democratic People’s Republic of Korea had no intention of abandoning its nuclear or missile development. Dialogue had instead been used as the best means of deceiving the international community and buying time. In 1994, the Democratic People’s Republic of Korea had no nuclear weapons and its ballistic missile technology was far from mature. Yet, Pyongyang was now working to attain hydrogen bombs and intercontinental ballistic missiles. Repeated attempts to resolve issues through dialogue had come to naught, he said, questioning what hope of success remained if the same failure was repeated a third time. “We must make North Korea abandon all nuclear and ballistic missile programmes in a complete, verifiable and irreversible manner,” he stressed, adding that pressure was needed, not dialogue. Japan would face up to the Democratic People’s Republic of Korea’s nuclear and missile threat through the Japan-United States alliance, he said, adding: “We consistently support the stance of the United States that ‘all options are on the table’.” His country appreciated the Security Council’s unanimous adoption of resolution 2375 (2017), which imposed strict sanctions against the Democratic People’s Republic of Korea and intended to intensify pressure to force that country to undertake a fundamental change on its path.